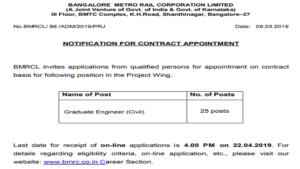 BMRC recruitment 2019: Eligible candidates are invited by the Bangalore Metro Rail Corporation Limited (BMRCL), for the posts of Graduate Civil Engineers. Eligible and interested candidates can apply for the post on or before 22 April 2019. Candidates can get more updates by visiting the official website-bmrc.co.in/kannada.bmrc.co.in. 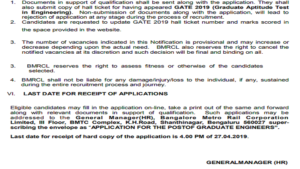 BMRC recruitment 2019: Bangalore Metro Rail Corporation Limited (BMRCL) has released applications to recruit eligible candidates for Graduate Engineer posts through GATE 2019. Eligible and interested candidates can apply for the post on or before 22 April 2019. 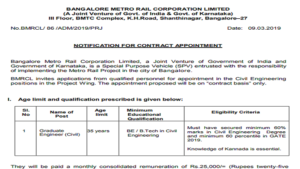 For more updates candidates are requested to visit the official website-bmrc.co.in/kannada.bmrc.co.in. note: The number of vacancies given in this notification is provisional and may increase or decrease depending upon the actual need. • The selection will be as per candidates merit, on the basis of Gate 2019 score. • Shortlisted candidates will be called for verification of the original documents(DOB, Address proof) and Kannada test. • The appointment of selected candidates will depend entirely upon the final verification of educational qualification, age, and verification of antecedent/character of the candidate. • The incumbency of contract appointment will be initially for a period of 2 years. • The contract of appointment may be terminated by either side by giving 3 months prior notice or by paying the contractual remuneration of three months instead of the notice period in case of emergency. 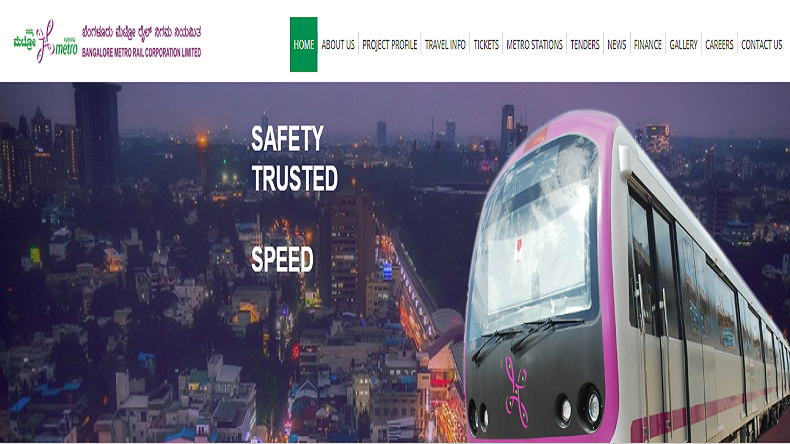 Bangalore Metro Rail Corporation Limited (BMRCL) is a joint venture of Government of India and Government of Karnataka which purpose to vehicle entrusted with the responsibility of implementation of Bangalore Metro Rail Project. This is the first metro rail project in India commissioned with 750V DC Third Rail on Standard Guage.